Ah it’s Sunday morning – I haven’t even got out of bed yet and the thought of my daily routine with the 7 different products that I apply to face is seeming quite daunting. As a beauty blogger this is hard to admit, but it’s true. On mornings like this, I’ll be reaching for a facewipe! There are some brands, and some products which may not be the most glamorous, but they are essentials. I’m sure all of us own something from Nivea, whether it’s the blogger’s favourite – the express hydration primer, or their fantastic Micellar Water (review of that coming soon), their suncreams, or just a lip balm or a deodorant. Firstly the Daily Essentials Sensitive Cleansing Wipes. Despite my fondness for the beautiful products sitting within my bathroom cabinet, on some days I simply can’t be bothered. I want my skin to be left clean and moisturised but maybe I’ve just eaten a huge macaroni cheese and want nothing more than to lie down and go to sleep, or perhaps I’ve had a little too much to drink… the usual routine just isn’t going to happen. 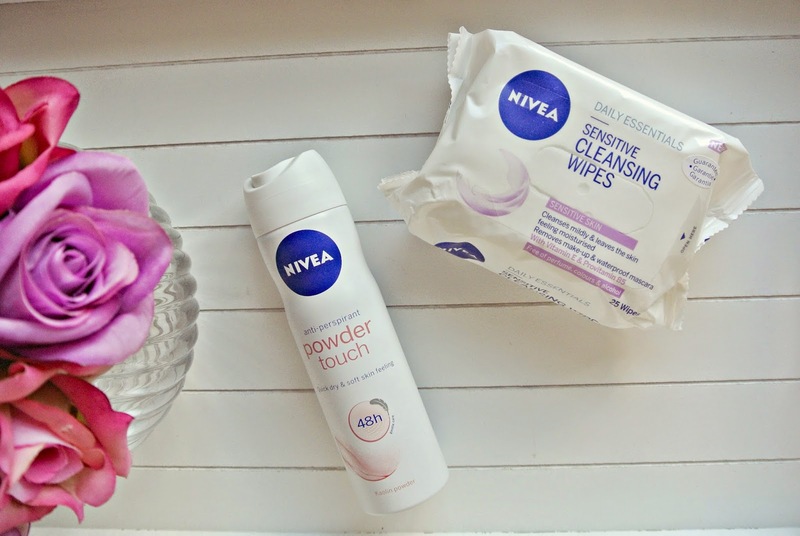 So a face wipe is the solution – and the Nivea Daily Essentials Wipes are my top choice. I used to just grab whichever wipes were on offer in Boots, but since picking up a pack of the Nivea wipes for sensitive skin, I can’t go back. Upon pulling the wipes out of the packet, they feel drier than many other wipes i’ve tried – they don’t leave residue on the hand and still remove all makeup and leave my skin feeling thoroughly cleansed. The material is a soft pillowy weave, which effectively works to remove all surface dirt and makeup traces. The wipes have only a very light fragrance – almost ‘cucumbery’ which adds to the refreshing feel of the wipes and my skin feels cool and calm after using them. Secondly the antiperspirant Powder Touch deodorant. Now i’m not going to write a huge spiel on this, but rather just say a few words – firstly the fragrance is really lovely, delicate, it reminds me of clean bedlinen and has a lily of the valley scent. The formula dries instantaneously leaving underarms dry and soft, and well – it works, surely that’s the most important thing with deodorant!